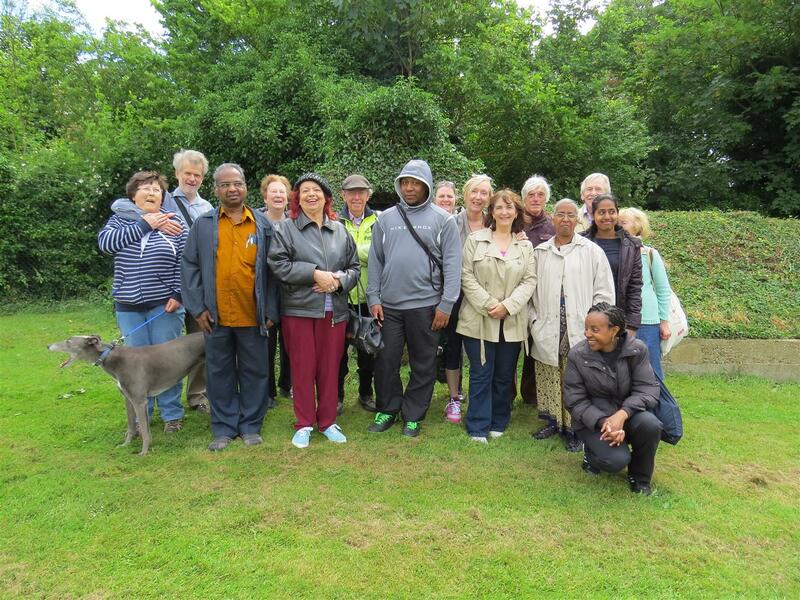 To celebrate Civic Day (22 June 2013), Mitcham Cricket Green Community and Heritage organised a walk around the boundary of the Cricket Green Conservation Area. The Wandle Industrial Museum. A fascinating local museum that’s just celebrated its 30th year of operation. Cricket Green. We glimpsed a view of the Cricket Green – the place where cricket has been played longer than any other – more than 300 years! Cold Blows. An ancient trackway whose name gives a clear indication of how it can feel on chilly, windy days. Three Kings Pond and Three Kings Piece. This green is the site of the Mitcham Status Fair – a very historic fair indeed. Lunch after the walk involved its own element of history as it took place in the Toby Carvery that looks over the News of the World sports ground. The Carvery occupies what was once one of the three Great Houses of Mitcham – the 18th Century Park Place. In the photo below the happy walkers stand outside a World War II bomb shelter in Mitcham Garden Village. This entry was posted in Cricket Green Conservation Area and tagged Civic Day, Cricket Green Conservation Area, Heritage Lottery Fund, Vestry Hall, Walk on June 22, 2013 by mitchamcricketgreen.